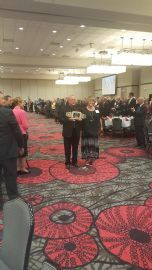 GK Vern Ortmeier and his wife Rita show off the First Place ICC Belt won by Council 7034 for the Culture of Life ICC award. 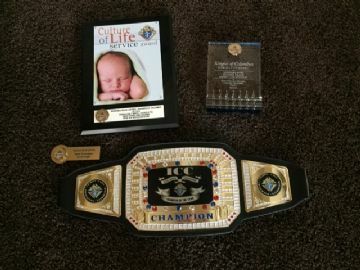 First place Culture of Life award, 2nd place council recruiting award, Gold Star council award and most importantly the first place ICC Belt that Council 7034 won out of 176 councils. This was presented for the council's work with the Bethlehem House. Congratulations to all members that helped to make this possible! 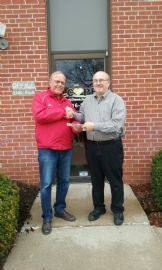 GK Ortmeier presenting a $1500 check (proceeds for the 4/22 Pancake Breakfast) to Jim Tomanek who is the executive director of C.O.P.E.. Jim was delighted with the efforts of the Knights and generosity of the St. John parishioners. Good food and friends enjoying a beautiful day at Santa's Woods. Looks like someone is headed for seconds! Fun on the bales. Got "The Dab" going on! Knights helping Nichele move from the Bethlehem House into her new apartment. GK Vern Ortmeier is taking the picture. Great job guys! Knights just finished moving Taylor into her new digs. Time to eat. Hotdogs and pulled pork sandwiches. Brother Knights get another Bethlehem House graduate (Samantha) moved into new quarters. Nice turn out for the Faith Formation night served by the Knights. Molly overseeing the Faith Formation Dinner. Relax Molly the Knights have you covered! 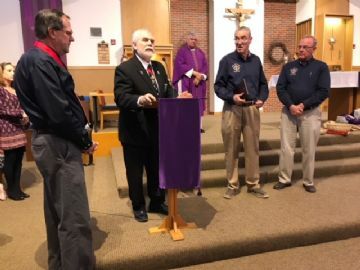 PGK Heng and current Grand Knight Ortmeier on behalf of Council 7034 accept the Columbian Award from Nebraska State Deputy Lou Gasper. Bethlehem House graduate Kendra Rogers moves into a new townhouse. She was overwhelmed. The Knights helped make the move possible. 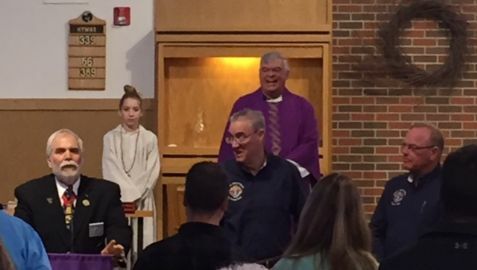 Brother Vern Ortmeier saying "I've got pancakes and somebody is going to eat them!" A few "guests" over for breakfast! Serving up a morning feast! The "Crew" helping at Joe Paladino's; installing rails etc. GK Vern Ortmeier is taking the picture. The fires are burning for a great evening outdoors. Warm by the fire after the ride! Brother Mejstrik and McKernan- great cooking guys! Another railing from deck to house for Joe P. Nice work brother Knights. Thanks Knights for the great food and a fun day! Looks like a full load. Lunch after the heavy lifting. Good turn out for Hayrack Ride 2017! Habitat For Humanity- Taking a Break- picture by Brother Tylski. Well, at least some of the Knights are working! Click on "News and Announcements" to the left and then open "2019 Scholarship" for information about the scholarships and the form to complete. Questions can be directed to the Scholarship members whose contact information is on the second page. NEW! Starting in February we will be saying the Rosary prior to our monthly meetings. It will start at 7 pm and is optional to attend. The regular meeting will still start at 7:30 pm. 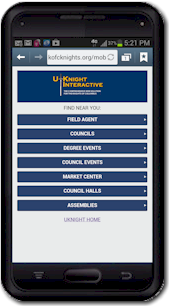 Click on Members Only to the left of this screen and log in with your member number and birthdate, then scroll down to Access Current Meeting Minutes and click on Current Meeting Minutes or Access Current Treasurer's Report and click on Current Treasurer's Report. Is your family a Domestic Church? Please read the attached brochure. Click on "News and Announcements" and click where indicated.